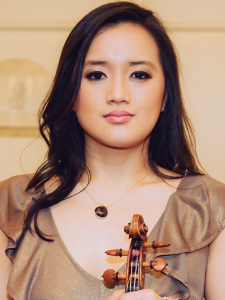 Sarah Sew is recipient of the Maisie Lewis Young Artists’ Fund Award which supported her recital debut at Wigmore Hall in 2011, Emanuel Hurwitz Award for an outstanding UK violinist, J & A Beare Prize and Pavlovíc Award. She appears throughout Europe as a guest concertmaster, director and soloist. As a recitalist and chamber musician, Sarah has performed internationally at Zermatt Festival, Switzerland; Bolzano Festival, Italy; Grafenegg Festival, Austria; Cheltenham Festival, UK; Interlaken Classics, Switzerland; Thessaloniki Concert Hall, Greece; Kanagawa Kenmin Hall, Japan; Wigmore Hall, UK; Kings Place, UK and the Open Chamber Music Session at the International Musicians Seminar, Prussia Cove. As concertmaster Sarah has worked with conductors such as Vladimir Ashkenazy, Semyon Bychkov, Sir Colin Davis, Gianandrea Noseda, Claus Peter Flor, Matthias Bamert, Oliver Knussen and Thierry Fischer and soloists such as Itzhak Perlman, Pinchas Zukerman, Yefim Bronfman and Garrick Ohlsson. She has appeared as concertmaster at international festivals and venues such as the BBC Proms; Carnegie Hall, New York; World Expo, Shanghai; Aldeburgh Festival, UK; Berlin Konzerthaus and Concertgebouw, Amsterdam. Sarah served as Concertmaster of the European Union Youth Orchestra for its 2010/2011 and 2011/2012 seasons. She returned as Guest Concertmaster in summer 2012 to play the violin solos from Schindler’s List and Also Sprach Zarathustra. Sarah also spent two years as Principal First Violin of the RTÉ Concert Orchestra in Ireland, run by Ireland’s national broadcaster Raidió Teilifís Éireann. Sarah has appeared as a Guest Leader of orchestras including BBC Symphony Orchestra, RTÉ National Symphony Orchestra, English Symphony Orchestra, Balkan Chamber Orchestra, RTÉ Concert Orchestra, Nevill Holt Opera Orchestra, Camerata Ireland and the Human Rights Orchestra in Lucerne. Sarah has performed, toured and recorded extensively with orchestras including the London Symphony Orchestra, London Chamber Orchestra, Scottish Ensemble, Aurora Orchestra and London Sinfonietta, working with conductors such as Valery Gergiev, Daniel Harding, Kurt Masur, Esa-Pekka Salonen, Christoph von Dohnányi, Edward Gardner, András Schiff and Vasily Petrenko. As a session musician Sarah has recorded major commercial scores, including soundtracks for the final two Harry Potter films, TV series Downton Abbey, video games series Halo; in addition to classical works at Abbey Road, Angel and Air Lyndhurst Studios in London. Sarah has worked with many living composers and has recorded new commissions by James MacMillan (Live at Wigmore Hall), Richard Causton, Graham Fitkin, Nigel Hess and Stephen Hough. She has participated in world premieres by Michael Zev Gordon, Joe Cutler, Richard Dubugnon and Benedict Mason, and as an orchestral leader has also worked with HK Gruber, George Benjamin and Oliver Knussen. Sarah studied with Maurice Hasson and Howard Davis at the Royal Academy of Music in London and Friedemann Eichhorn at the Hochschule für Musik Franz Liszt Weimar in Germany with the support of the Arts and Humanities Research Council, Countess of Munster Musical Trust, Martin Musical Scholarship Fund, San Martino Scholarship, Lynn Foundation and South Square Trust. Sarah graduated with a first class honours bachelor’s degree, master’s degree with distinction and discretionary prizes and honours including the DipRAM, D M Lloyd Prize, Lesley Alexander Award and Peter Latham Gift. From 2012–2016, Sarah was a Concordia Foundation Artist and Yeoman of the Musicians’ Company in the UK. As a soloist Sarah has performed concerti by Bruch, Elgar, Mendelssohn, Mozart (No.3, No.5 & Sinfonia Concertante), Tchaikovsky and Vivaldi (Four Seasons) with various orchestras throughout the UK and Ireland. In 2012 she was rehearsal soloist for Pinchas Zukerman with the EUYO and in 2018 toured South America and China as Director of the EUYO, including performing as soloist in Recomposed Vivaldi Four Seasons by Max Richter. Sarah is Artistic Director of Beckett Chamber Music Series in Dublin. She has worked as first violin sectional tutor for the National Youth Orchestra of Ireland since 2017. In August 2018 she took up the position of Professor of Violin and Head of Strings and Chamber Music at the Royal Irish Academy of Music. Sarah plays an Italian violin by Gennaro Gagliano c.1760.